Over the years, there have been many games released in Japan only. Of these, a small number have gone on to become cult classics abroad—lost gems of gaming that the English-speaking world missed out on. Even now, with virtual consoles and re-releases, some of these games have never gotten an official international release (though many do get fan translations). And with the recent resurgence in interest courtesy of Earthbound's re-release on the Wii U's virtual console, I decided to sit down and play through one of the most infamous of all Japan-only games, Earthbound's sequel, Mother 3. “Mother” really is the perfect name for this game—but not because mothers play a large role in the story, but rather that their absence does. More than anything else, Mother 3 is an exploration about the loss of a mother and how that one act topples the lives of all those connected like a series of dominoes. The young boy Claus ventures into the wild to kill the T-Rex-like creatures he feels are responsible for killing his mother; and then he disappears. With the loss of a wife and son, Flint spends his days in the wild looking for his missing son. And the remaining son, Lucas, grows up shy and alone—yet self-sufficient. None of the other main cast members seem to have mothers either. Duster's father is a verbally abusive, crotchety old man, but his mother is nowhere to be seen. Yet despite the abuse and his physical handicap, he is often the strongest physical fighter in your team. Kumatora's parents are nowhere to be seen as well which has turned her into a strong, self-reliant tomboy. And as for Boney—well, Boney's a dog. 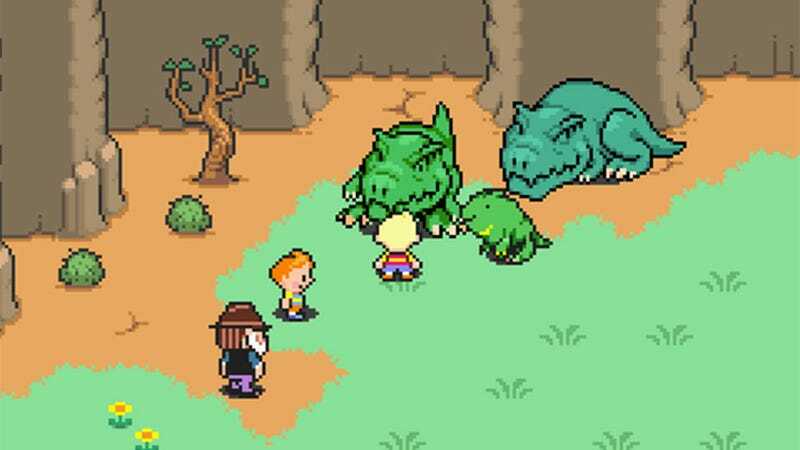 As a game quite literally built around the concept of the loss of a mother, Mother 3 works hard to play on those emotions. The game's entire first chapter is a tragic tale in its own right, showing the death of a mother, disappearance of a son, and the resulting fallout through the husband/father’s unique point of view. And then even after a time jump, we see how the loss of a wife and son has destroyed this man's life—leaving him unable to care properly for his remaining son. As the game moves on, Lucas—once the epitome of a momma’s boy—confronts the loss of his mother directly by fighting those responsible for her death. And in the end, the game comes to a climax in a truly emotional, heart-wrenching scene where the broken family must finally come to terms with all that has happened due to the loss of a mother in their lives. A few months back I wrote that I like there to be some sort of active element in my turn-based battles—something to keep the tension high like having to dodge enemy attacks or even just a time limit in choosing my next attack. Mother 3's main active element in battle is the musical combo system. There is a specific beat in the background of every piece of battle music in the game. If you tap the button along with this rhythm as your character attacks, you can attack up to sixteen times in one turn. To hear this rhythm more clearly, all you need to do is put the enemy to sleep and that will bring the rhythm to the forefront of the music. Mastering the beats of each song is not easy—especially as many songs include tempo changes—but it is definitely fun and keeps the game from feeling boring in battle. Better still, there is a second active element in battle in addition to the musical combo system. In Mother 3, your HP is set on a dial like an odometer. Even if your characters receive a killing blow, you have until the odometer ticks down to zero to heal them, giving you one last chance to save them if you're fast enough. Of the game's eight chapters, the first three are almost a ten-hour prologue to the game's main story. This section of the game and the game’s climax are as dramatic, heartbreaking, and as well written as any game story has ever been. The middle majority of the game, however, drops any semblance of a deep emotional narrative. Instead, the game focuses on cute—and often crazy—humor to get by. This can be anything from a bathroom-themed dungeon to a merman statue you have to make out with to refill your oxygen level. It is mindbogglingly random and, more often than not, hilarious. However, when set next to the more serious sections of the game, the humor portions could not be more thematically opposed. So while some people will be able to enjoy both the humor and the drama, others will no doubt feel that the humor undercuts the game's serious and emotional message. The masked villain twist is handled especially poorly. When the bad guys let Lucas into their secret base, mistaking him for their commander; and knowing that Lucas also has a missing twin brother, is it really all that hard to connect the dots? This obvious twist really undercuts your (the player’s) emotional connection to Lucas when he has the revelation—because you figured it out twenty hours before him. And as the masked villain is such a cliché anyway, it's hard to take what is clearly the most emotional scene in the game all that seriously. Mother 3 is an excellent RPG. It has a deep emotional plot, crazy comedic aspects, and an excellent battle system. The exploration of the “loss of a mother” theme is handled amazingly well, though the plot twists and humor can serve to somewhat undercut the game's more serious aspects. That said, it is definitely one of the rare Japan-only games that really does live up to all the online hype. Mother 3 was released on April 20, 2006 for the GameBoy Advance in Japan. There are no plans for an international release.